This is a Cauliflower Karanji/ Modak recipe, using the stuffing of the usual Cauliflower vegetable preparation. This Flower Chi Karanji, which is crispy and filling snack is another one of my Modak experiments using different kinds of stuffings. Mix the Gram Flour, hot Oil, Carom Seeds, Red Chili Powder, Salt, and Water and prepare a thick Dough. Heat the Oil and add the Onion, Green Chilies and fry for two-three minutes on a slow flame. Then add the Coriander, Salt and cover with a steel plate by adding some Water over the plate. Cook for five minutes on a slow flame. Remove the plate and cook the Cauliflower till slightly dry. Add the Coriander, Lemon Juice and mix it well. 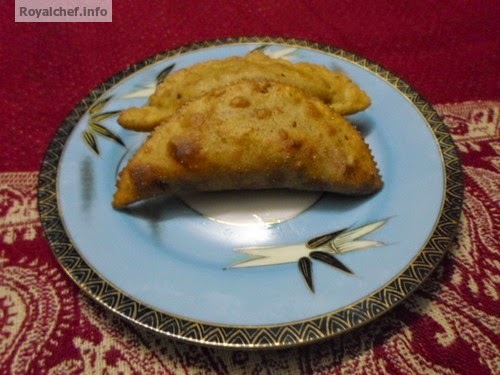 Prepare small balls from the Dough and roll them into Puri shapes and fill a table spoon of the cauliflower mixture into it and fold the Puri then give them Karanji shapes. In the manner a Modak Shape can also be given. Heat the Oil in a Kadhai and deep-fry the Karanji shapes till color changes in to brown. Serve hot. कृती :– बेसन, मैदा, तेलाचे मोहन, ओवा, लाल मिरची पावडर, मीठ व पाणी घालून घट्ट पीठ माळून घ्या. फ्लावर धुवून बारीक चिरून घ्या. कांदा चिरून, हिरवी मिरचीचे बारीक तुकडे करा. कढई मध्ये तेल गरम करून त्यामध्ये मोहरी, जिरे, हिंग, कडीपत्ता व कांदा घालून थोडे परतून घ्या. नंतर त्यामध्ये हळद, मीठ व बारीक चिरलेला कॉलीफ्लॉवर घालून झाकण ठेवा. झाकणी वर थोडे पाणी घाला व मंद विस्तवावर भाजी शिजवून घ्या. भाजी शिजल्यावर त्यामध्ये लिंबू व कोथिंबीर घालून भाजी थोडी कोरडी करून घ्या. बेसनाच्या पीठाचे छोटे-छोटे गोळे करून ते पुरी सारखे लाटून त्यामध्ये १ टे स्पून सारण भरून कडेनी थोडे पाणी लावून पुरी बंद करू घ्या. 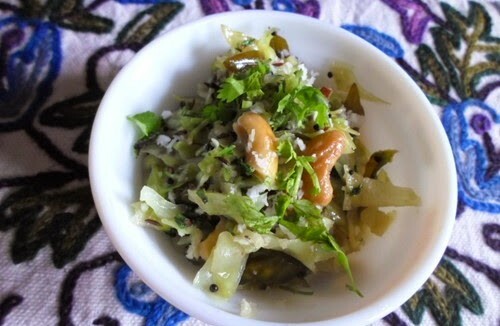 आपल्याला पाहिजे तो आकार द्या. कढई मध्ये तेल गरम करून मोदक ब्राऊन रंगावर तळून घ्या. हे मोदक खूप कुरकुरीत होतात.